LA JOLLA, CA—More than 11,000 Americans suffer spinal cord injuries each year, and since over a quarter of those injuries are due to falls, the number is likely to rise as the population ages. The reason so many of those injuries are permanently disabling is that the human body lacks the capacity to regenerate nerve fibers. The best our bodies can do is route the surviving tissue around the injury site. 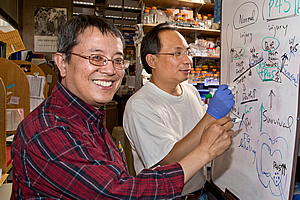 From left to right: Salk scientists Kuo-Fen Lee, and Tsung Chang Sung. In a paper published in this week’s PLOS ONE, Lee and his colleagues describe how a protein named P45 may yield insight into a possible molecular mechanism to promote rerouting for spinal cord healing and functional recovery. Because injured mice can recover more fully than human beings, Lee sought the source of the difference. He discovered that P45 had a previously unknown neuroprotective effect. In a human or a mouse, the success of an attempted rerouting after a spinal cord injury depends on how much healthy tissue is left. But wounds set off a cascade of reactions within cells, which if not stopped in time will result in more dead and dying tissue extending beyond the injury site. Nerve traction from the injury site leads to disconnection of the network required for normal sensory and motor functions. Lee found that P45 is the key factor determining whether the cascade continues on to its destructive end. A complex of proteins, by sequentially interacting with each other, induces this cascade of cell death. Lee discovered that P45 is a natural antagonist to this process. Antagonists are molecules, some naturally occurring, some made in pharmaceutical laboratories, that work essentially like sticking gum in a lock. Because the antagonist is in place, no other molecule can get in. In this case, P45 prevents two other proteins in the death cascade from connecting, rendering their actions harmless and stopping cell death. Spinal cord injury triggers massive cell death, as indicated by the number of pink cells (left). However, this process is markedly reduced when the levels of p45 are increased in those cells (right). But there’s more to how P45 works that gives Lee hope that he may be on to a unique approach to finding new ways to treat spinal cord injuries. In other recent findings, which are being prepared for publication, his team saw P45 also yield positive effects, specifically the encouragement of healthy tissue growth. Thus, Lee concludes its real role may be as a sort of “see-saw” molecule that tips the balance in the cascade from negative to positive. “The great thing about P45 is that it can both inhibit the negative by blocking the conformational change that would lead to more cell death, while promoting the positive-the survival and growth of tissue-thus making it easier to foster recovery following spinal cord injury,” Lee explains. The next step for Lee’s laboratory will be to seek either a gene, or a process that works in a similar see-saw way in humans, or can be made to work with therapeutic intervention. Still, Lee cautions, this remains a proof of concept experiment in mice. 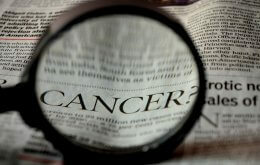 Even if such a mechanism were found in humans, clinical applications would be years away. Other researchers on the study were Tsung-Chang Sung, Zhijiang Chen, Sandrine Thuret, Marçal Vilar, Fred H. Gage and Roland Riek of the Salk Institute. This work was supported by the National Institutes of Health, National Institute of Aging, MDA, Clayton Foundation, Paralyzed Veterans of America Spinal Cord Research Foundation, the Paralysis Project of America, Christopher and Dana Reeve Foundation, Ministerio de Economia y Competitividad and the Institute of Health Carlos III.